A DHC-8-400 passenger plane, operated by Croatia Airlines, was damaged in a nose gear-up landing at Zürich-Kloten Airport (ZRH), Switzerland. None of the 64 occupants were injured. Croatia Airlines flight OU464 departed Zagreb-Pleso Airport (ZAG) at 17:46 on a regular flight to Zürich. The flight was uneventful until the approach to Zürich. The flight had been cleared for an ILS approach for a landing on runway 14. At about six nautical miles from the threshold, the first officer lowered the landing gear lever to the DOWN position. Subsequently, the flight crew heard a loud and repetitive sound, which was described as being "like a rubber hitting a metal". The flight crew was under the impression that two components were hitting each other in the nose landing gear bay. The flight crew then checked the landing gear indication lights on the instrument panel. Both main landing gear indication lights were green, indicating a down and locked position. The nose landing gear indication showed a discrepancy between the landing gear control lever and the landing gear position. At this point, the flight crew decided to discontinue the approach and informed air traffic control accordingly. 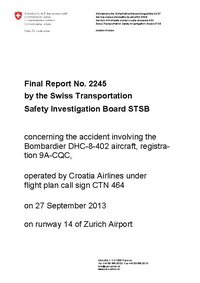 Immediately, Croatia 464 was ordered by ATC to climb straight ahead to 4000 feet QNH. A holding pattern for troubleshooting was offered by ATC and accepted by the flight crew. At 19:39 flight 464 entered the holding pattern at FL90. Since the alternate landing gear extension procedure was not successful, the flight crew then went on with consulting the airplane manufacturer's flight operations service letter (FOSL) concerning issues with the landing gear. The problem persisted. The flight crew finally decided to perform the landing at Zürich Airport with the nose gear in the retracted position. At 20:18, the airplane touched down on runway 14 with its main landing gear. As the airplane was decelerating, the nose was lowered and the airplane came to a complete stop 540 meters after the forward lower fuselage had come into contact with the runway surface. During the technical investigation of the airplane by the Swiss Accident Investigation Board, the nose gear weight on wheel (WOW) cover plate was found squeezed between the lower and the upper drag strut of the nose landing gear. The WOW cover plate had previously fractured at the lower left and right lug enabling the pivoting of the plate upwards. The accident is attributable to the fact that the flight crew was not successful in extending the nose landing gear and then had to conduct a landing with extended main landing gear and retracted nose landing gear. - The WOW [weight on wheels] cover plate on the nose landing gear was broken on both lower lugs so that it was bent upwards around the upper tab mounts and was trapped in the nose gear mechanism, which prevented the extension. - The way the WOW cover plate was mounted led to lateral forces on the WOW cover plate and mechanical stress in the area of the upper and lower lugs during operation of the nose landing gear steering. - There were weld defects in the area of the lower lugs. Distance from Zagreb-Pleso Airport to Zürich-Kloten Airport as the crow flies is 601 km (376 miles).